DJI has finally dished full details of the FPV goggles that were teased at last year’s Mavic Pro event. The DJI Goggles, as they’re called, work with the Mavic Pro, Phantom 4, and Inspire series drones. Have you ever seen the Oculus Rift? It’s like that but mixed with the magic of DJI Company and two 1920x1080 screens. That’s more pixels than any headset I’ve ever used, and the colors are good too. However, this isn’t just a nice pair of HD screens. On the left side, you will find a capacitive touch pad. When you have the goggles on, you see not only a video feed but also a HUD (heads-up-display) with useful flight information and settings that you can change on the fly. Using the touch pad, you can even change settings on the drone (like camera exposure white balance and more) all without ever looking down at your controller! Additionally, you can use the 5D button and the buttons on the back of the Mavic Pro’s controller to navigate, so your hands never have to leave the controller. None of these features matter if the video feed isn’t good, but DJI didn’t disappoint in this area either. 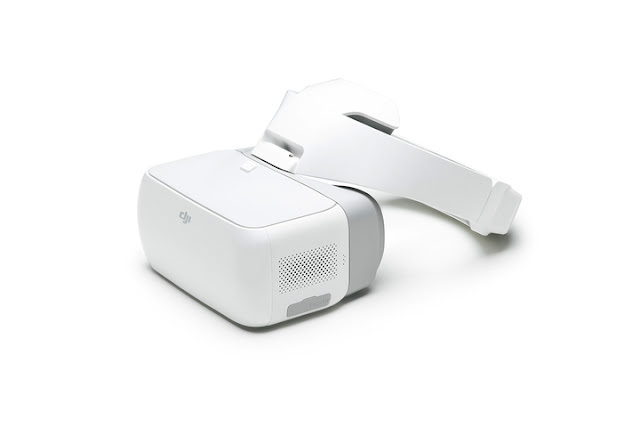 The DJI Goggles use OcuSync (the data transmission technology from the Mavic Pro) to communicate directly with the drone that you’re using. This means low latency 1080p video at 30fps, 720p 60fps, or 720p 30fps (when shooting in 4K). 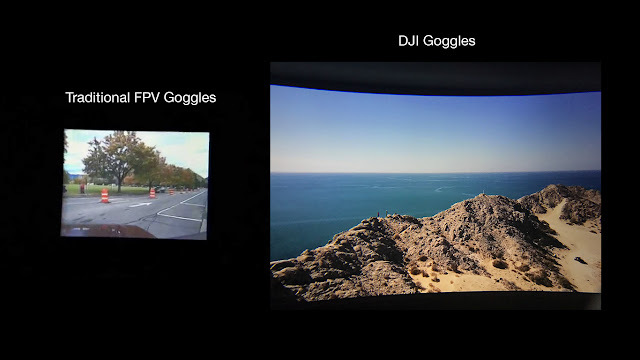 The Dji goggles feature two 1080p displays with an 85 degree field of view. The new Ocusync technology (successor to the Lightbridge system) is built into the headset, allowing you to get a live HD video feed directly from the Mavic Pro without the need for wires between the headset and the controller and reducing lag. As always, DJI love the idea of sharing. 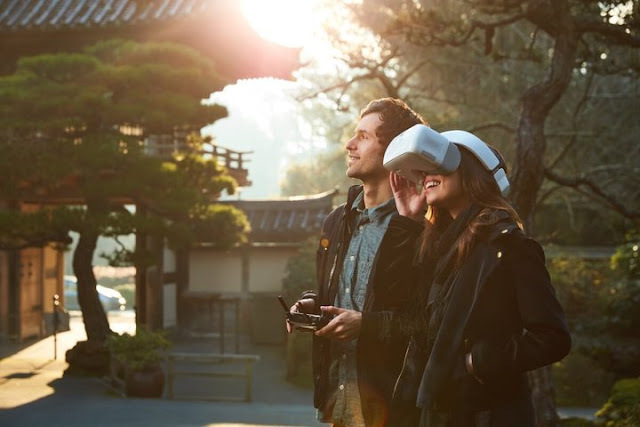 You can either give the video goggles to a friend while you fly or you can bind two goggles to one aircraft and both enjoy the immersive experience together. The most interesting thing about these goggles is that DJI is promising users can both fly the drone and control the camera gimbal using just their head movement, thanks to an embedded accelerometer and gyroscope. While some drone enthusiasts have hacked together similar solutions in the past using an Avegant Glyph or Oculus Rift, DJI’s betting on a more end-to-end solution. Compared to traditional Goggles for FPV racing, the DJI goggles are not even on the same planet. Here is a comparison just putting a camera up to the lenses of both goggles. Obviously, a picture will never do justice, but it should give you some idea of what I am talking about. 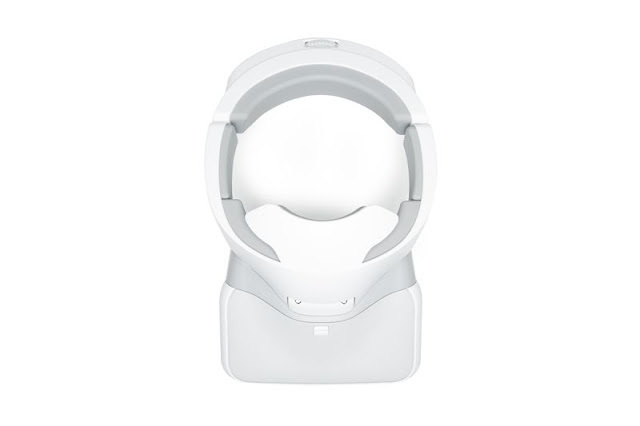 The DJI Goggles display a 1920X1080 image in front of each of your eyes, which is like having two HD displays strapped to your face. The company says that wearing the goggles is like looking at a 216-inch home theater screen set about three meters away. You can wirelessly connect to a Mavic Pro or Phantom 4 drone and use head movements to control both aircraft yaw -- the spin around its center axis -- as well as camera tilt. Up to two goggles can connect to the Mavic Pro drone, so you can share your aerial adventures with a friend, too. In short, if you want video goggles for flying your DJI Mavic, you have to use the DJI Goggles. Even though most people thought the goggles will only work with Mavic Pro (that’s what the announcement video suggested as well), in reality that’s not the case. Since DJI Goggles price is $449, it’s natural they work with all drones from DJI’s last generation. In addition to the awesome Mavic Pro, DJI Goggles will also work with all of their current generation drone models. That includes both versions of the Phantom 4, standard and Professional, Inspire 2 and the already mentioned Mavic Pro. 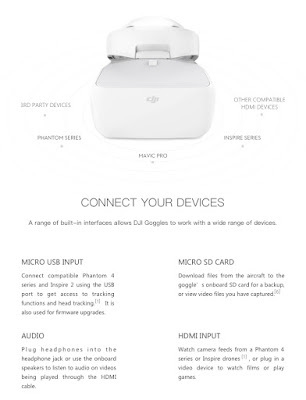 The first reason to buy Dji Goggles now it’s the limited of stock and the price will be higher than now. 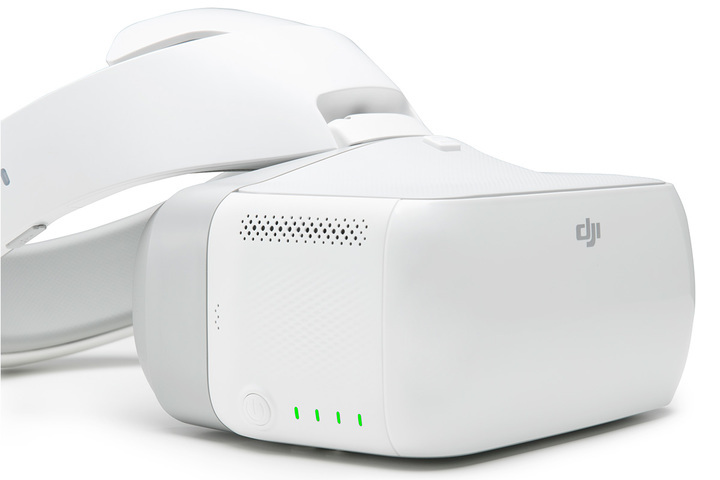 The DJI Goggles are priced at £499. That’s not cheap but it’s fairly reasonable when you compare it to the price of other video goggles on the market. DJI has also improved its new three-axis camera stabilizer with the new Ronin 2. The update is aimed squarely at filmmakers like Ethan Hawke, who used the original Ronin to film his biopic Blaze. The gimbals on Ronin 2 have more power, says the company, which gives them more torque to carry larger cameras. The carbon fiber monocoque frame is light and sturdy, and DJI has improved the ability to connect cameras and accessories via the Ronin 2's integrated power and data ports. 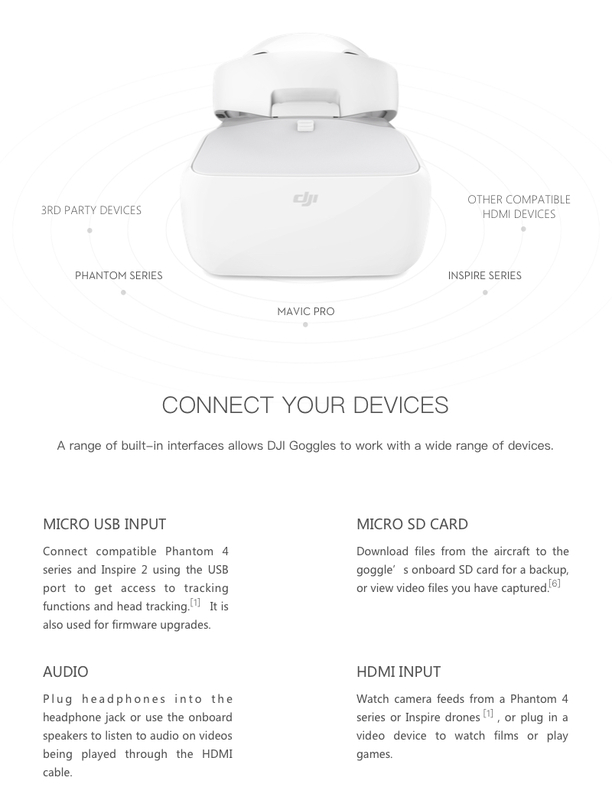 Overall, what we enjoyed about the DJI Goggles is that they are simple, intuitive, comfortable and fun. We truly believe this immersive experience is one that a person who owns a Mavic Pro would love. You’ll experience the Mavic in a way you never have before. We also think that by showing friends who have never experienced the RC hobby these goggles that there’s a good chance they will be interested in joining in on the fun! The only “issue” we came across is that there is a little light leak with smaller/narrower noggins. We hope that this review is helpful for you as you make the decision to experience flight in a new way! What do you think about DJI Goggles price?